Reading skills are becoming more and more significant aspect of learning in this digital age, there is no point of denying this fact that people like to go through websites more than books. Therefore, reading‘s importance should be correlated with the enhancement or improvement in the domain of learning. Research has suggested that kids can develop reading skill at as early as infancy. Many people find reading as a difficult task to perform while some people love reading books and other stuff that make them knowledgeable as compared to those people who do not read. In order to improve or enhance reading trait, following are the ten ways through which reading skills can be polished. If you want to enhance your learning then start reading books or any other stuff that is easily available to you. The newspapers, magazines, books and other printed content are the major sources of improving or increasing one’s reading skill. Therefore, a person should keep books or other informative stuff all the time with himself or herself. You better study in the morning when your mind is fresh and ready to grasp or understand the concepts and notions of topic quite easily. Therefore, it is strongly recommended to read in the early phase of the day and at the same time scheduling a reading habit develops and results in better outcomes of the reading. There is strong likelihood that selecting an appropriate or desirable content makes your task of reading enjoyable and productive. As a result, a person can read the whole content in an efficient manner and in this way he or she can improve his or her imaginative traits as well. This is a matter of fact that mind starts working when people read or write about their favorite topic. If you are reading something and your brain is not asking any question or it could be said in other words that questions are not arising in your mind then there is something wrong. This is an important way that helps in evaluating your understanding about the topic. This is how reading should enhance or improve the working of your mind. In this way, you will start looking for answers so that you will be able to compose or satisfy yourself to a considerable extent. These questions can also be developed through analyzing and comprehending the subheadings of the topic in an appropriate way. This is also helpful in separating the useless or unnecessary information provided in the content of a topic. This is an important aspect to consider that it is good to have positive feelings and emotions while reading. This is because of the reason the physical position of a person and the place where a person is reading does also affects the habit of reading a great deal. One thing is also significant to remember that reading improves generally in the daylight so try to perform the task of reading in the day time. The reading of difficult and cumbersome content requires full level of concentration. Therefore, always read or make sure that you read these kinds of content on table, not on other stuff like a bed or on a sofa. Every reading material or content does have some significant attributes or points that are required to be observed or analyzed during reading. This tactic will help in focusing on the key facts of the content and at the same time you do not need to read the whole material again. In this way, ample amount of time will be saved. You had better adjust your reading pace according to the material nature and requirements. The reason is quite obvious as some kinds of stuff require fast pace and some stuff can be studied at a slower pace. It depends actually on the nature of the content and at the same time the purpose of reading also plays a crucial role in drawing deliverables of reading. This is the famous saying that practice makes a man perfect or in other words it could be said that practice improves expertise level of a person in a great way. Moreover, more reading is required in order to become effective readers. This is necessary because reading again and again will improve the reading speed and at the same time it also helps in understanding different aspects of the topic in an effective manner. 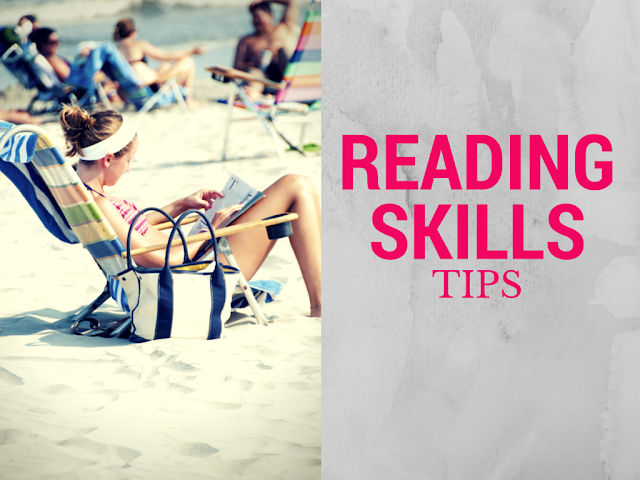 In order to remain active and efficient reader, the concentration needs to be maintained all the time during reading. In this concern, the main objective of reading should be kept in mind because you are reading for specific goal, which you want to achieve. Sometimes, it might happen that you may lose your focus and interest while reading the subject. Therefore, in the larger interest it is recommended to take breaks or distract your mind in convenient way. This will help in concentrating on the topic and as a result interest will be sustained for longer period of time. In the last but not the least, it is quite necessary to monitor your progress and evaluate the outcomes in a desired manner. It is a good way of observing and exploring the difference between the target that was allocated at the start of reading and the results attained after certain period of time. In the way, the difference between the desired outcomes and actual results can be found. This will also help in restructuring and reallocating the reading objectives in an appropriate manner. Reading requires lot of practice and focus and after considering the above skills, reading could become an exciting and productive activity. There is need of understanding this aspect that this activity should be enjoyed as much as possible. As a result, it will certainly provide desired outcomes in the end. Amelie Millie is the owner of an academic writing company full assignment help that handles academic writing projects in all topics and subjects. She also has a keen interest in web and application development and has written articles on various blogs on this topic.